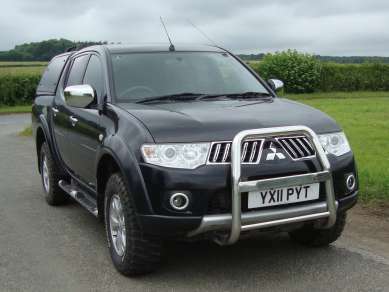 MARCH 2011 MITSUBISHI L200 2.5 Did TROJAN DOUBLECAB PICKUP, BLACK, 81,650 MILES, RADIO/CD, AIR CON, E/W, REAR HEATED WINDOW, ALLOYS, UNDER RAIL LOAD LINER, CANOPY C/w pop out windows, spoiler and roof bars, TOWBAR C/w Jaw n Pin. MOT JULY 2019. SERVICE HISTORY.